Let’s get to work together on Transforming Your City! Leadership Coach Dr. Dave Robinson is recruiting – and we believe that the fact you are here is an indicator that you are a Marketplace Leader and we appreciate the opportunity to help equip you in your work to Transform Your City! Connect with Coach Dave today! Become a member of the team at TransformingYourCity.com. With your donation of any amount, you’ll have online access to Dave Robinson’s “Idle in the Marketplace” audiobook. “Idle in the Marketplace” is the popular must-read concerning the Church’s most important mandate and, for your contribution of $35 or more, we’ll include a print version as well – perfect for highlighting and taking notes. 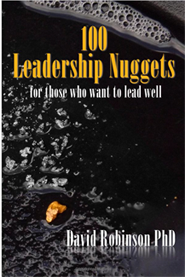 We’ll also send you a print copy of Dave’s popular 100 Leadership Nuggets – the perfect guide for those who want to lead well. Your gift will help Transforming Your City impact lives globally for the Kingdom and Transforming Your City is part of E41 Market Place Ministries. Questions or prefer to connect by phone? Our toll free number is 844-706-1444 and we look forward to serving you!